Combine British wit, an astute eye for design and an unyielding dedication to sustainable golf and what do you get? You get Peter Gorse, the outspoken founder of "Golf Refugees". Peter spent last week at the Ricoh British Open and wrote the following dispatch from the media center at Woburn Golf Club, especially for us. On arrival you receive a gift. Only the British would consider giving an umbrella for a major sporting event in mid-summer. Each journo is allocated a desk facing a manually updated scoreboard, fortunately the door between the food hall is left ajar and the waft of the cooking keeps you on your toes. My first press conference was with world number one Lydia Ko. Riveting snippets of information, from a preference to play a maximum of three tournaments in a row and liking nine plus hours of sleep a night, to seeking the best local eateries from resident Woburn tour pro... and Ryder hero... Ian Poulter. I must admit I was a little surprised with Lydia’s reply, though perhaps I could have phrased my question better and expanded upon the recent announcement from the European Tour to pilot a new shorter, faster format. Ko responded. “I don’t believe golf needs to change" adding that she loves the traditions of the game and feels there are enough formats in golf already. OK. Anyway, onto more interesting topics; women’s golf fashion. I’ve always wanted to find out just how much apparel company-sponsored pro golfers know about the clothes they wear and promote. At the back of the 18th green, after the first round, I managed to catch up with USA star Lexi Thompson, who is charming and captivating. I began with, "as one of the most fashionable players on tour", she smiled. "How much input do you have with the golf clothes you wear?" "What is your favourite material?" “Ones that feel silky and elastic” and with a big smile, Lexi pulled down on her shirt to see how far it could stretch. You could deduce that she doesn’t really know the technical names of the materials used in modern sportswear. She simply goes on how the clothes feel to her, which is understandable as Lexi’s priority is to win golf tournaments. Lexi could always look to see what’s written on her shirt label. One of the main talking points between fathers and club members was the set up of the Marquess Course, conspired by the Ladies Golf Union. 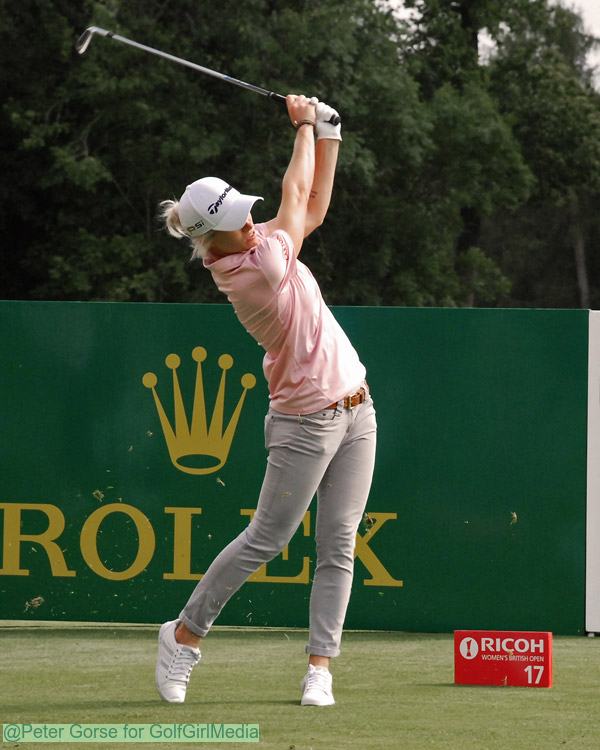 Now local hero Charley Hull, sponsored by Ricoh, is the cover girl for the tournament. Charley has been playing around Woburn since the age of eleven from the back white tees. For some unknown reason the LGU have decided to play the British Open from the forward tees and reduce the overall yardage to a tame 6,400 yards. Some expressed their concern that this would lead to a winning score of 20 under par and result in a putting competition. Ariya Jutanugarn who can hit a 2-iron 240 yards, wins again... and without carrying a driver in her bag all week. On the final day of the British Women’s Open from Woburn it is time to reflect on what has been an incredible well organised event. I just hope the mountain of coffee cups and lids from the media centre can be reused or recycled, otherwise its dial ‘G’ for Greenpeace.